This article makes a case for research to be conducted into how leaders at the local school level are implementing Australia’s first national curriculum, the challenges and enablers they are encountering in leading this implementation, and the role of professional development in supporting such implementation. According to Gerrard et al. (2013), the Australian Curriculum represents a significant intervention in educational practice and governance and thus provides a unique opportunity to research changing systems and school-level practices involved with large-scale curriculum reform. While there has been research into large-scale educational reform in other areas (see, for example, Bishop & Mulford, 1999; Ford, 2012; McCormick & Ayres, 2009), presently there is limited research in this particular area of curriculum change. This is not surprising given the recency of this implementation since 2012 in most states and territories. 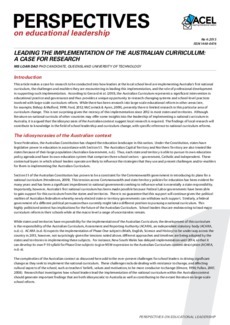 Although literature on national curricula of other countries may offer some insights into the leadership of implementing a national curriculum in Australia, it is argued that the idiosyncrasies of the Australian context suggest local research is required. The findings of local research will contribute to knowledge in the field of school leadership and curriculum change, with specific reference to national curriculum reforms.